Post feature Report RSS	What Is… Laser? We’ve already taken a look at Worbital’s most basic attack weapon—Railgun. It’s bombastic fun, but how about other sorts of fun? This week, we show off a different kind of weapon, more precise and deep-cutting. Give it up for the Worbital Laser. If you’re not much into projectile shooting or just can’t be bothered with the gravity, Laser is the weapon for you. Essentially, it’s a giant beam you can fire through space. Like Railgun, Worbital Laser was also inherited from its turn-based predecessor, Interplanetary. However, there is a big difference. 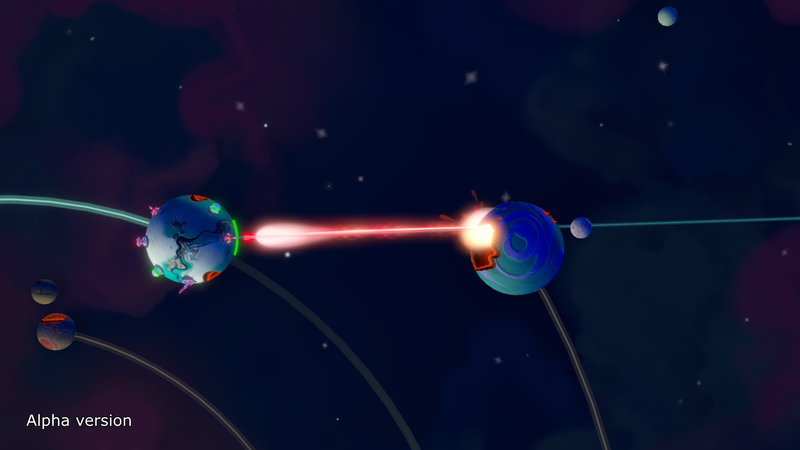 Interplanetary Laser allowed you to target to a precise point on the enemy planet. Unless there was an obstacle between yours and the enemy’s planets, there was pretty much no way to miss. Now, in Worbital, Laser is not quite that flexible. The trajectory of the beam depends mostly on the position of the Laser-structure on your base planet. It shoots in a straight line from the building, so you need to make sure that your target is directly across from your Laser. As you level up your laser, you get to have some control over the angle of the beam. The power of a Laser depends on the duration of attack. When you have an enemy object in range, select the appropriate Laser on your planet and hit the fire button. Laser will keep firing for as long as you’re holding the button (or until the weapon runs out of charge). The key for dealing some real damage is getting the beam concentrated in the same spot for a continuous period of time. If you manage that, you won’t be disappointed. It will cut through the planet surface as if that was butter. Laser is also a great defense tool, as it can swiftly destroy many projectiles coming your way. We’ll share more about the other Worbital weapons in the upcoming weeks, so stay tuned.